Each year, we test at least a dozen factory liquid cooling systems for CPUs. They are all built on the same principle and are maintenance-free type that greatly simplifies the process for users of assembly / installation and further exploitation. Only recently have we studiedFractal Design Kelvin S24 compares favorably with other expansion options and a copper heat sink. Nevertheless peremptory leader in efficiency it could not be. Since the enhancement of such systems from the point of view of increasing the cooling efficiency and reducing the noise level is very limited, that with each new model qualitative leap usually occurs. However, the same situation we are now seeing for several years in the air cooler for the CPU. Yet there are positive developments, and today the object of testing – Corsair Hydro Series H105 – and all of us could surprise. But let us still do not get ahead of ourselves and tell you everything in order. Specifications liquid cooling Corsair Hydro Series H105 are shown in Table. 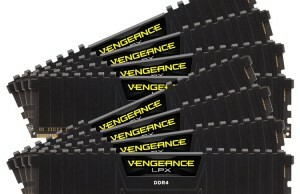 Corsair products are easily recognizable thanks to the distinguished design of packaging, designed in the same style. A large cardboard box decorated predominantly in black with red accents and white lettering. Read the information easily, and at the same time all design does not look pretentious and too catchy, as is often the case. On the front side of the box shows the cooling system, given the model name and the supported platforms. The sides of the most informative. One of them contains the technical characteristics of the system in six languages. The second is reserved for the description of the key features and the list of supported processors, as well as a small graph comparing the efficiency of the system and “boxed” cooler Intel. On the front side of the box you can find specifications, list of supplied components of the system and the size of the radiator. Inside the main box is optional basket of porous cardboard with compartments for each individual component. This top is closed to shopping cart padded polyethylene foam. We can say that packaging is sufficiently reliable to keep Corsair Hydro Series H105 intact at all its way to the final buyer. 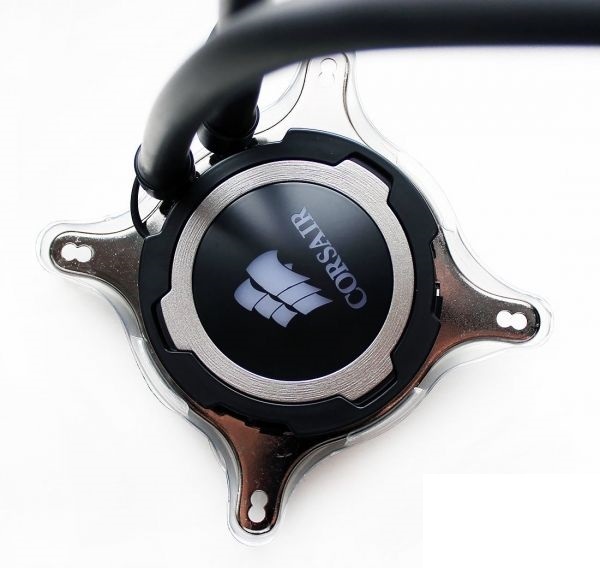 Corsair Hydro Series H105 is manufactured in China and is recommended for sale for $ 120 without a single cent. In Russia, the system at the time of preparation of this article was worth 8 thousand. The warranty period is five years. Structurally, the Corsair Hydro Series H105 is not much different from other similar systems. At its core – an aluminum radiator, which is connected by two flexible hoses with fanfare, coincident with the water-block. The system is closed, filled with non-toxic and anti-corrosive refrigerant and fully operational. Refueling system circuit design it is not possible. 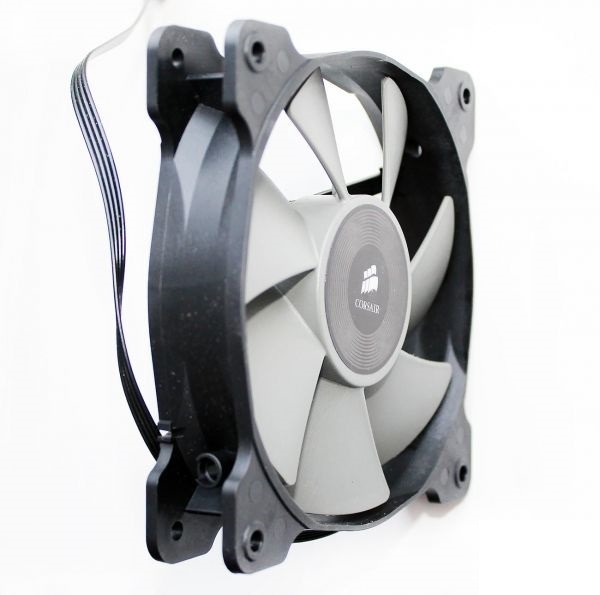 To the radiator can be set as four 120-mm fan, although the system is equipped with only two. The length of the flexible hose is 300 mm and its outer diameter is 10 mm. Wire braid hoses in this system is not. As already mentioned above, the aluminum radiator. Its dimensions are 272,5 × 120 × 38 mm, and the thickness of the “working fluid” is 27 mm, which is immediately to 10 mm larger than similar systems. That is, it is clear that engineers Corsair decided to increase the area of ​​the radiator due to its thickness, increasing the efficiency of such a straightforward way. In addition, the radiator and structurally slightly different. Instead of 14 channels are used only 10, but with a large distance from each other, which is equal to 12 mm. And cell gofrolenty between channels also larger than other radiators in this class. 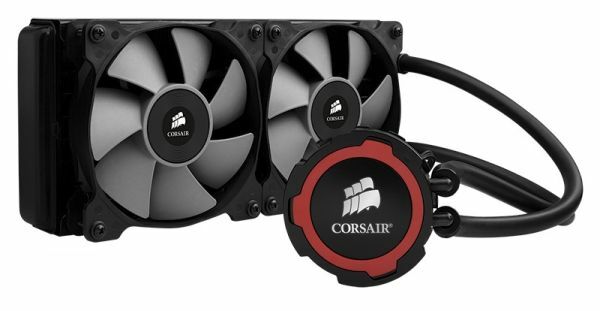 Thus, even though the increased thickness, it can be assumed that the radiator Corsair Hydro Series H105 should better be cooled by air flow from the fans, particularly at low speeds. Radiator fitting located two external diameter of 6 mm, which is pressed in on the hoses. Compression hose and pump with water-block, but here swivel fittings, which facilitates their passage inside the computer chassis and reduces the probability of excesses to a minimum. A distinctive feature of the pump is a cover with illuminated logo Corsair and interchangeable colored rings. In addition to the established nominally gray ring, complete a more rings of red and blue. It is possible to match the color of the pump cover in such a way that it is better harmony with the other components of the system unit. As for most pumps, something about it is not known virtually nothing. Specialists Corsair did not indicate in the characteristics even noise, not to mention the traditionally concealed performance. We only know that ceramic bearings in the pump and that the duration of continuous use – more than 5 years. According to the results of our measurements, it turned out that the pump rotor speed is 1890 r / min (compared to 1500 rev / min at the pumps Asetek) and that its level of power consumption is 4.14 watts. On the water block is also little known. It copper, with a base diameter of 54 mm. Its internal structure of the microchannel, and on the basis of a thin and uniform layer suffered a thick (much thicker Arctic MX-4) thermal interface gray. The contact surface is flat, that, together with the high clamping force, has allowed us to obtain uniform prints almost the entire area of ​​the processor heat spreader. The only pity is that this factory method of applying the thermal interface is suitable only for a single use, and additional thermal grease is not supplied. 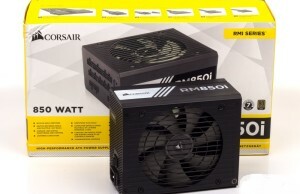 The system is equipped with two high-performance fans Corsair SP120L . This model was developed by specialists Corsair fan to provide high static pressure throughout the speed range of the seven-bladed impeller and has a wide blades. 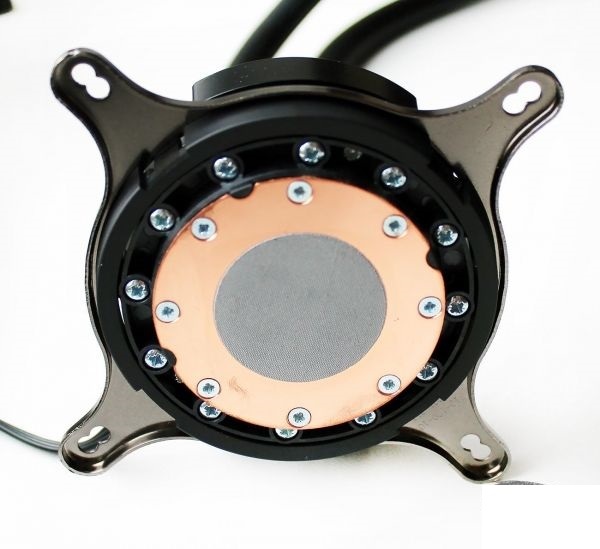 With a maximum speed declared at around 2700 rev / min, fans can develop pressure of 3.9 mm H 2 O, which is really an outstanding performance for 120 mm models. Unfortunately, the level of the minimum pressure at 800 rev / min in the characteristics says nothing. Airflow each such “pinwheel” can reach 74,42 CFM, the noise level – 37.68 dBA. The service life of the hydrodynamic bearing fans is unknown, but he is unlikely to guarantee at least five years, so there should not be a cause for concern. On the label of the fan stator given operating voltage and amperage. According to the results of our measurements, each such fan at maximum speed consumes less than 2.2 watts and could start at a voltage of 4.0 V. The cable length is 300 mm and 280 mm more to them adds Y-splitter. Fixed fan on the radiator with conventional screws. Corsair Hydro Series H105 can be installed on any modern processor, with the last level of heat is not limited. Thus the company makes it clear that the system is ideal for overclockers. As for the installation procedure itself , it is simple and intuitive. 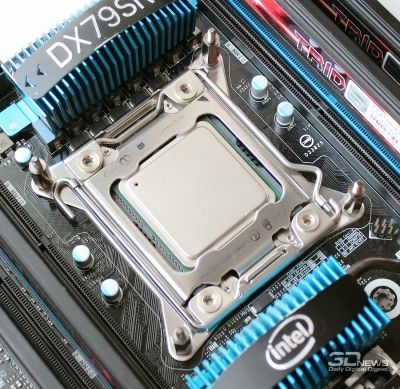 In principle, the installation of the water block on the CPU for different platforms do not differ, used only individual support sleeves and reinforcement plate. Last platform with LGA2011, which we use, is not required, and the sleeves are screwed directly into the holes of the plate processor socket. After such training is necessary to place the motherboard heatsink inside the computer chassis. This will require at least two adjacent seats for 120-mm fans, where they are attached to the radiator and. Generally, in the Corsair offer fastened directly to the body radiator, and then later on it to install fans. However, this arrangement of the radiator may not all computer chassis, while the two adjacent seats for 120-mm fans are quite common.Furthermore, from the viewpoint of achieving maximum efficiency intake fresh air fans is of a chassis and then in the direction of its priority over the radiator, rather than directly from the housing. Main then quickly bring the hot air out, what our Antec Twelve Hundred is no problem. In complete darkness, light water block Corsair Hydro Series H105 looks pretty nice and original. This is not a picture or screenshot, this is a photo backlight pump. Unfortunately, Corsair Hydro Series H105 does not support the proprietary interface Corsair Link, so the software to manage and monitor its parameters, as implemented, for example, in the model h110i GT , it is impossible.